In this episode, we are exploring the underappreciated and underresearched aspect of the social ramifications of living with chronic pain. 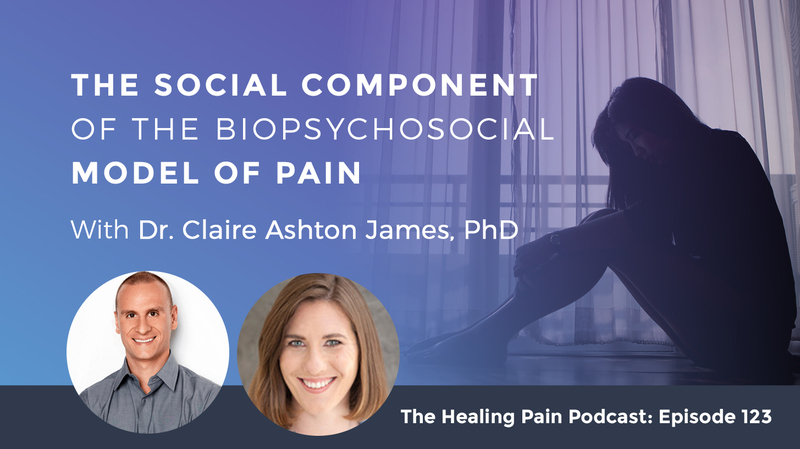 If you follow this podcast, you’ve heard many experts express that we should be shifting our treatment of chronic pain from what’s known as a biomedical model to what is called the biopsychosocial model. Our guest is Dr. Claire Ashton-James. She is a social psychologist whose research investigates the social aspects of health and well-being with a focus on pain management. The overarching aims of her research are to evaluate and improve treatment delivery and patient outcomes including pain, quality of life and social well-being. Dr. Ashton-James conducted her PhD research at the University of New South Wales in Australia and at Duke University in the United States of America. She conducts interdisciplinary research with collaborators in dentistry, maxillofacial surgery, clinical psychology, experimental psychology, physiotherapy and medicine. She is actively involved in providing continuing education for healthcare professionals. We cover how culture influences pain and the importance of patient-provider communication. The role of bias in the medical encounter, the impact of patient trust on pain, health behavior and well-being. Finally, the role of group-based pain management programs and their influence on outcomes. This is a great episode if you’re interested in the social component of the biopsychosocial model. Claire is a wonderful resource of information as a great body of research on this particular topic. Claire, welcome to the Healing Pain Podcast. It’s great to be here with you. I’m excited because you are the first social psychologist I’ve had here. I’ve had lots of clinical psychologists, but we’re going to talk about the social aspects of pain, which is underresearched without a doubt. We know a lot about cognitive, emotional, CBT, ACT and all those things. Tell us what social psychology is and how you became interested in it. Social psychology is the study of social behavior, which is interesting because all behavior is social. It’s the study of behavior. It’s the study of thought and emotion in social life and how social context shapes thought, emotion, physiology, brain functioning and every aspect of psychology. We’re all humans living in a context. Social psychology is the study of how that context impacts on or contributes to all aspects of humanness from cognition, thought, behavior, feelings, attitudes, beliefs, motivation, attitude formation and all those processes. It’s very broad. I was studying business at the time and I was interested in organizational psychology. I was interested in human performance and how emotions influence interpersonal behavior. I was interested in leadership and how leaders as humans, how did their emotions influence how they behave? I then did a PhD looking at moods and how they influence interpersonal behavior. The theme of my research in my career has been looking at mood states and affective states and emotions. That led me to pain because a significant dimension of pain is affective. It made sense to me to look at how pain influenced interpersonal behavior. That was my entrance into the pain world, to look not at social antecedents of pain and not looking at necessarily how social factors shape pain, but how pain shapes interpersonal behavior in social life. I was looking at the backside of the problem. That was fascinating and I’m happy to talk to you about that research. I found myself working more and more in the pain world. I started looking at the social antecedents of pain and how social contexts molds pain experience. Let’s start with the social antecedents first because that’s something very new that people will be interested in hearing. For those practitioners as well as the general public, what does social antecedent mean? Social factors can shape wound healing and pain interference to the extent in which we allow pain to stop us from doing things, seek rehabilitation, and return to work. An antecedent is a jargon word for something that proceeds or contributes to. Pain is a complex phenomenon and a subjective phenomenon that has several evaluative components. It involves an evaluation of sensations as being aversive. It involves evaluation sensations as being potentially harmful and it involves a construal of sensations as being threatening and feelings of distress. There are lots of room for subjectivity in there. There’s an interpretation involved and that interpretation may or may not be conscious or explicit. It may just happen by association in your mind automatically. There’s lots of room for social factors than to influence the interpretation of sensations and pain. There are lots of ways in which social factors can shape the expectations of pain and pain sensitivity. It can shape pain behavior. Social factors can shape wound healing and pain interference to the extent to which we allow pain to stop us from doing things and shape rehabilitation and return to work. There are so many ways in which social factors can come in and affect not only the experience of pain but also how we cope with pain and pain management outcomes. There are several social factors. Social psychology is very broad. Similarly, social aspects of pain are very broad. There are interpersonal factors that shape pain and those are things like adverse childhood events and individual’s attachment style. There are interpersonal factors that shape all of these aspects of pain experience and they are things like a social observation. Observing someone else’s response to pain. Social reinforcement is the impact of other people’s reassurance or lack of reassurance on our experience of pain and pain behavior. Perceived social support is another interpersonal factor that shapes pain experience and the clinical encounter. That’s a patient-doctor interaction. That has become the mainstay of my research. There are within group level factors. Social bonds for example within groups, which has interesting implications for group-based therapies. Many multidisciplinary pain programs are conducted in groups and that has an impact on people’s outcomes. Those group dynamics influence pain. Sociocultural norms influence how we experience and express pain. Then there are between group factors. Having minority group’s status experience of stigmatization. At the macro level, there are societal and environmental factors. Social inequality influences pain experience, social capital, medico-legal systems and organizational culture. It’s shocking when you think about the complexity and richness of social factors that impact on the experience of pain, wound healing, return to work and the fact that this is such an understudied area. The most profound discrepancy in pain management is that there’s this incredible volume of evidence that social factors play into the effectiveness of treatments. It plays into people’s ability to recover from surgery and recover from injury and cope with pain and yet, interventions for chronic pain are not social. Meaning everyone is saying it’s the biopsychosocial model, but people don’t know what the social end means. No, they just do the bio and the psycho. If it’s pharmacological and they do a lot of clinical CBT, it’s primarily psychological therapy. There are some social aspects to be at multidisciplinary pain programs, but considering how vast and impactful these social factors are, it shocks me that there are not more social interventions. The social component isn’t integrated more heavily into these supposedly multidisciplinary programs. What is a social intervention in the context of pain? In the ‘80s, they were doing a lot of social interventions and couples’ therapy. Frank Keefe at Duke University has done several studies demonstrating the efficacy of couples-based therapy for chronic pain and the effect sizes are never large, but they’re similar to or equivalent to the effect sizes of CBT with individuals. One wonders, would it not have an additive effect to do both? That’s a question that I have. Why are we not doing both? The obvious answer would be resources. It’s resource intensive to do social interventions. With new technologies, ACT and social networking. We’ve come a long way since the 1980s. Maybe the time is now that we can start doing social interventions for pain. Oftentimes in a multi-interdisciplinary pain program, there will be a group component to it whether it’s group CBT or exercise program and many different types of groups. Is that enough or are we caging it within the individual disciplines? By is that enough, I’m assuming you mean is that enough for the social intervention? Yeah, does that then say, “We do have a social intervention at our hospital. We have group CBT or we have group MBSR classes.” Is that enough? My instinctive reaction would be no considering that social factors include things like adverse childhood events. The group processes aren’t necessarily going to help people with that. Whereas therapy that specifically helps people with interpersonal difficulties that have arisen from adverse social traumas maybe more effective. The other issue with groups is that it’s difficult to control group dynamics. It’s not necessarily going to help every individual within the group because remember that the people’s pain behavior is shaped by social observation. What if you’re in a group with people who are not motivated, who don’t want to do the exercises, who are high catastrophizers? How does that impact on the individual who has high self-efficacy and perhaps would have done better in another group? It’s quite worrying. My colleagues and I have published a couple of papers on this now. We find that the group that individuals are in at these multidisciplinary pain programs predicts their individual outcomes. Just the group they are randomly allocated to. I have a friend who’s a psychologist who’s done some of this work. She does not like group therapy. I say, “Why?” She says, “Because sometimes more often than not, there can be a hive mentality where they want to kill the queen bee and I am the queen bee. I’m sitting up there at the top.” I was like, “That’s interesting.” I’m willing to bet that people like yourself are starting to look at groups. What is it about a group that informs a very good social intervention? What are the components that make a group successful? How do we choose who should be in group A versus Group B so that the success is better? People tend to do better when they have more positive treatment expectations. Before we worry about groups, we should see first whether or not group-based therapies for pain are more effective than individual. I have no doubt that the experience of belonging that people get from being in a group of people suffering from a common disease, provides people with a sense of identity. It provides a positive sense of self and inclusiveness that they may not have experienced for many years. That can be extremely positive. Just having that experience of inclusiveness and belonging creates a sense of positive mood, which then influences people’s confidence to try exercises. It helps with pain interference and once people are moving, they’re going to be distracted from their pain. There are more ways that a group could benefit individuals than harm them. It’s important to be aware that there will be variation in the effectiveness of groups. As the practitioner, when you are laying the groundwork for that group, you’re starting to inform them of what the group is about. If you are careful about what you’re saying to people and create a group setting that is compassionate, where people feel that they belong, where there’s confidentiality that’s respected amongst the group, where people find their friendship and the camaraderie, you set a tone for a group right from the beginning that can change the entire dynamic. I’m not sure how many practitioners have it laid out on paper and practice that over and over again. That’s a whole another level of clinician training is group facilitation. It dovetails into another domain of my research which is clinician communication and patient-clinician interactions. This is like group facilitation, clinician communication is not taught. As a non-clinician, I can’t understand how you can even go out into the world. You learn all about what pain is and how to treat it and manage it and then the patient comes to you and you ask, “Terry, when did your neck pain start?” The patient replies, “When I was a teenager, my dad used to slam my head against a brick wall and it started after that.” You’re a new physio graduate, a 24-year-old or a clinical psychologist or a pain medicine physician. How do you respond to that? That’s a real example that happened that I witnessed. Most people when I tell them whether they’re 65-year-old pain medicine clinicians or new pain medicine clinicians, they all stopped and go, “I don’t know how I would respond to that.” There are ways. A social intervention for chronic pain management would be to train clinicians in interpersonal skills and emotion-handling skills to be able to deal with that scenario. That would be an effective social intervention. There are many ways that we can draw around research in social psychology on relationships or on emotion disclosure. James Pennebaker has done amazing work on emotion disclosure and how that helps to heal. There’s follow-up research that Kathryn Pollak at Duke University has done. Steve Linton in Sweden has found that if you allow patients to talk about their emotions and feel their emotions to disclose, it’s very healing for them. It helps with their pain distress and pain interference. Whereas I think that the tendency is for the clinicians to try and switch that off because they don’t want to distract it from getting through the list of diagnostic questions that they need to get through. You would know better than me. You’re a physio yourself. I used to do the hiring for a large physical therapy group here in New York City. I’ve interviewed thousands of physios. 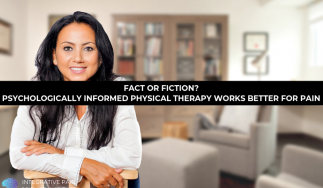 When you ask the typical question, “Why did you want to become a physical therapist?” 99% of the people say, “I want to help people.” It’s perfectly normal. Then you hire them and you’ve watched them. They are young twenty-year-olds in their first job in an environment, especially one like New York City where there’s an element of culture shock that happens. There are so many different cultures here and there are wealthy people and there are poor people. People are speaking in different languages and different sexualities. That’s what the average clinic looks like. I’ve watched therapists struggle. I can see their pain because you can tell they want to help people, but they can’t access, “What do I say or what do I do now with whatever is happening here?” The amount of people who break down and cry in the PT practices is quite high because you’re dealing with physical pain, but we all know there are emotional aspects that either run through a line. Some people, whether it’s through their upbringing or through their life experiences, we’re able to roll with that a little bit easier. There are other people that are bamboozled by it and they go home. They’re exhausted because they don’t have social skills to deal with that. It’s not just in physical therapy. I know this happens with physicians. I saw physicians who would say, “I’m sending this patient to you because I don’t know what to do with them.” I always know what that meant. That meant that there was an emotional patient there and they started having a discussion that they couldn’t handle. They couldn’t negotiate. As you were starting to do some research and looking at the patient-clinician interaction, what do practitioners need to do in their initial evaluation to make it more socially informed from a biopsychosocial perspective? What I think you are asking is what can clinicians do to improve patient outcomes from a social standpoint or how can you boost patients outcomes using social interventions? A very basic and well-demonstrated intervention is based on placebo effects. We know that people tend to do better when they have more positive treatment expectations. Expectations are social construals. There are things that we come to an appointment with expectations based on our previous social experiences. You can also shape patients’ expectations based on the way that you behave and the way that you appear. This has been something I’ve found fascinating. As you may be aware, first impressions matter. You might be very empathic, very caring and deeply concerned about a patient. If a patient’s first impression of you is that you’re cold, then that’s going to anchor their subsequent evaluations of you. Treatment expectations can be shaped by the patient-clinician interaction in the way that the clinician presents him or herself. What I found in my research is that trust perceived trustworthiness of the clinician is really important. Then the question becomes, “How do we appear more trustworthy?” It seems like this elusive thing. We need to appear more trustworthy, “How do we do that? What do I do?” I did research into it and I found that patients perceive clinician’s trustworthiness from their emotions in part, specifically from their expression of positive emotion. It’s important to note that the expression of negative emotion doesn’t interfere with your perceived trustworthiness. There is no relationship. If a patient is crying, you don’t have to smile. If a patient is telling you something that makes you feel compassionate or anger on their behalf or some injustice is being to them, you’re allowed to frown. That’s okay. The expressions of empathic reassurance and pride in the patient and a general pleasant affect and happiness to see the patient really goes a long way for trustworthiness and confidence is important. These are all the blanket generalizations I’m making. Factors that make surgeons appear trustworthy are different to the factors that make a clinical psychologist and chronic pain specialists appear trustworthy. It’s very different interpersonal attributes. If you look at any communication skills program anywhere in the world, it’s not individualized to the profession. You need to give eye contact, smile, shake their hands and build rapport. They’ll teach you how to appear empathic and warm. My research has found that for a surgeon, warmth can be detrimental to their perceived trustworthiness. It can freak patients out. “I don’t want a warm cuddly surgeon. I want a surgeon who’s not emotional and who’s going to be task-focused.” If you don’t pay attention to these nuances in social perception and the fact that they’re all context-specific, you’ll end up with this cookie-cutter approach to patient interactions. You’re talking about breaking down the therapeutic relationship and the therapeutic bond in different professions. I was at a conference and the presenter asked, “How many of you believe that you have above average skills in forming that bond?” The entire group raised their hand. He said, “How many of you believe you have below average skills?” Not one person raised their hand. It’s interesting the bias that we have as practitioners. We all think that we come out of the egg fully formed able to tackle whatever patients in front of us and what they’re grappling with but the truth is, we don’t. A lot of people are struggling and trying to figure out, “How do I weave this in?” With that in mind, you mentioned compassion. A psychologist friend of mine said, “Oftentimes, I have compassion fatigue.” I was like, “That’s an interesting comment.” Meaning, a few points toward professional burnout, but the other part I wonder, are they applying compassion at the appropriate time in the appropriate way with the appropriate patient? Compassion fatigue is because you’re feeling for the other person too much. Compassion is not feeling for the other person, it’s feeling concerned for the other person. It’s a feeling of respect and concern for another human being suffering paired with a motivation to help them. Pure empathy is quite disabling for a clinician and it doesn’t motivate you to help. It’s taking on the feelings of the other. It’s vicarious pain and emotion and that leads to compassion fatigue. There are skills that you can learn. Learning the difference and learning to reframe other people’s suffering as something that you can support them through and help them through as opposed to just feel with them. One of the things that I’ve started doing is emotion handling skills coaching for clinicians. We’re running a trial where I do one-to-one coaching with clinicians helping them to identify patient’s emotions and helping them to respond to them appropriately. There are two components there. It’s the ability to identify them and then there’s the ability to respond. There are obstacles to both of those things. Often, we don’t identify emotions because patients hide them by being angry, for example, when they’re just sad, nervous, and upset or disappointed. They might hide their emotions entirely by asking lots of questions rapidly. They’re very anxious so they ask lots and lots of questions. They appear to be together, controlled, articulate and high in health literacy. That can often be a behavior that signals someone is worried. I help clinicians to learn how to recognize emotions through behaviors rather than just through tears. Patients also don’t want to say, “I’m sad.” You can’t expect them to. Part of it also is helping clinicians to identify and respond to their own emotions. This ties directly into what you’re talking about with compassion fatigue. How many clinicians do you know that have had emotion regulation training? Learn how to recognize emotions through behaviors rather than just through tears. Do psychologists even have that? I’m not a clinical psychologist so I don’t know for sure. I’m assuming that they would. I was at a conference and I was assisting a psychologist. Her name is JoAnne Dahl and she started to develop a certain intervention using ACT. She places her hands on people. It’s not forceful. It’s just on shoulders or resting on the head or the back very gently. She’s trying to teach this to other psychologists. There were some in the room that were fine to do it and then there are others that said, “I’m very uncomfortable touching people.” I was going around and helping them with hand placement and things like that. I said, “That’s interesting. How come?” Someone said, “I’m not sure if it’s in my scope of practice.” That makes perfect sense because we do have the scope of practices and rules that certain psychologists have been taught or trained. They’re primarily the talking profession. Other psychologists said, “I just don’t feel comfortable touching people.” There are many reasons why a person might not feel comfortable touching people. I can see right where their own emotional comfort lies with working with their patient. What’s interesting to me in the world of pain is we know that placing hands is very therapeutic. That’s been proven everything from palliative care where people have a terminal up to little babies. It helps them develop. It’s interesting to see this topic come up in a lot of different places. Even social psychologists don’t fully understand it. There are several people around the world studying emotion regulation. Emotional intelligence back to Peter Salovey at Yale University. He looks at this idea of being able to identify emotions accurately in yourself and being able to understand the ways why that emotion has come up. Being able to understand the consequences of that emotion for your thoughts, your motivation, and your behavior and then being able to understand how to manage it and what to do about it. Maybe in the organizational psychology world, they might be the best at this. Psychologists definitely are at the forefront of emotional regulations. It’s interesting when you take it a little bit about their comfort zone, how it changes. I had this conversation with a psychologist where I said, “There have been times in my professional where I’ve touched people and it has not necessarily been a pleasant experience for me.” You learn to accept it for what it is. It’s part of the job. It’s something you have to do and sometimes people’s reactions to you touching them can be challenging. As a physio, sometimes you have to cause pain, for instance, a total knee replacement. We have to force range motion so they get the range of motion back within the first four weeks or else they’re at risk for another surgery. Our own emotional comfort level comes up in that. It’s interesting how this starts to overlap into different professions, different people and different topics. Can you talk to us about some of the social consequences that come up in someone who has to live with pain? It’s not a very happy story. 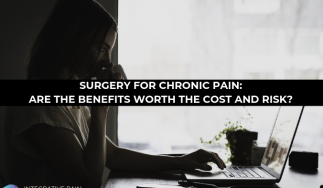 It depends whether you’ve got acute pain, post-surgical pain for example versus chronic pain. In acute pain, social consequences tend to be quite pleasant. Your expression of pain might communicate that you need help and people come and they bring you flowers at the hospital. You get a visit and you get more phone calls than usual and those things. That’s all great but if you have chronic pain, how many people get flowers for chronic pain? How often do you sent flowers and get well soon? It’s a different story. It’s important to distinguish between the pain conditions in terms of social consequences. Applying the research to humans and not just practice. In some ways, you were saying that as a society, we’re more compassionate or empathetic for those who have a new problem that we think is going to go away versus being there long-term for those who have problems that are chronic. For chronic pain, it’s not good news. People do get compassion fatigue. People do run out of empathy and that can be hard. I imagine, as a patient, to experience that when you’re experiencing pain as severe as the acute pain that someone’s experience with a car crash or whiplash. The consequences for people with chronic pain and are not too positive. It is associated with greater relationship conflict. It can influence family dynamics. The children of parents with chronic pain can be negatively affected in terms of social adjustment. These are all correlations. I have to point out that this isn’t every family with chronic pain and it’s not every person with chronic pain. These are just a risk factor for difficulties in the social sphere. There are individuals who are very resilient and they are amazing. The fact that there are individuals who have to cope with chronic pain so well, maybe we should be studying them more to find out what we can learn from those people. Instead of studying people with debilitating chronic pain, let’s find the people with chronic pain who are still out there working and contributing in society, maintaining self-esteem and mental health. Often, our healthcare system focuses on what the problem is, where is the problem, and how can we identify the problem? The solution is in the person who has figured out. That concept is mirrored in understanding social contributors to pain. I mentioned that adverse childhood events predispose people to chronic pain. In a way, it creates a vulnerability. The more adverse childhood events you have, the higher the risk that you would develop some chronic pain condition. However, there are people who’ve had extreme trauma and don’t have any pain conditions. Researchers have found that what really determines whether or not these adverse social conditions influence later experience of chronic pain is how the individual construes those events and whether or not there’s unresolved trauma. I’d hate for people to think, “I experienced something terrible, therefore this is a done deal.” It’s not the case. It’s a lot to do with how the individual responds to their environment that determines the impact of the environment on them. I would love to have you back on the show. This is such a fascinating topic. 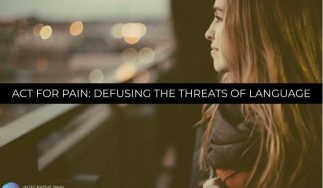 There are so many different facets of this aspect of pain. There are other people studying it, but you have one of the largest bodies of research currently building out there, which is great. Please do come back. Tell us how people can learn more about you. How they can learn about your research or find you on Twitter or a website? I don’t have a Twitter account, but I have an email. I’m always on email all the time and I love to communicate with people and share my research. I can be found by email at Claire.Ashton-James@Sydney.edu.au. I can also be found if you google me online. I work at the Pain Management Research Institute at the University of Sydney. The clinician coaching that I do is advertised through there. I run webinars as well on emotion handling skills for clinicians. I do workshops which are for people locally. Whenever I do these emotion handling skills coaching or workshops or webinars, people always asked me if I do it with the parents of children. They always say, “Do you do this for parenting as well? I’d like you to help me in that realm too.” I’m like, “It’s the same skills.” I encourage people to get involved in that. People will get a lot out of it and it’s helping clinicians to enjoy their work again. I want to thank Dr. Claire Ashton-James for being on the show. I ask you to share this out with your friends and family on Facebook, LinkedIn, Twitter or whatever your favorite social media handle is. Social psychology and the social aspects of pain is an area that we need more research in and an area that clinicians need to learn more about. If you’re someone with pain, hopefully, you learned a lot about how this impacts your pain and maybe the type of relationship you want to have with a clinician or how it impacts the rest of your life. I want to thank all of you for joining me. We’ll see you next time. Thank you. Dr. Claire Ashton-James is a social psychologist whose research investigates the social aspects of health and well-being with a focus on pain management. The overall goals of her research is to evaluate and improve treatment delivery and patient outcomes including pain, quality of life, and social well-being. She conducted her PhD research at the University of New South Wales in Australia and at Duke University in the United States. She currently conducts inter-disciplinary research with collaborators in dentistry, Maxillofacial Surgery, Clinical Psychology, Experimental Psychology, Physiotherapy, and Medicine, and is actively involved in providing continuing education to healthcare professionals.